On your next national park visit, remember that a spectacular sunset is just the prelude to the wonders of the night sky. Astronomy Night in the Park at many national parks across the country was a great success, said Chad Moore, manager of the National Park Service Night Sky Program. “We suspect the people who rediscovered the cosmos at one of our programs last year will return with friends and family or will travel to a different national park to share their experience of a starry sky, free of light pollution.” Activities included meteor watching, telescope viewing, solar viewing, instructional workshops, evening programs, night hikes, nocturnal wildlife watching, tips for protecting dark skies, and storytelling. The NPS has developed a Junior Ranger Night Explorer program, encouraging young park visitors to explore the dark side of their national parks. “Kids can learn how to find the North Star, write their own creative mythology about the constellations, track the phases of the moon, and learn about stars and galaxies, and use all their senses to explore the night environment at a national park,” said Angie Richman, astronomy ranger with the Intermountain Regional Office. The booklet was recently published and will be freely distributed in a number of national parks in 2010. 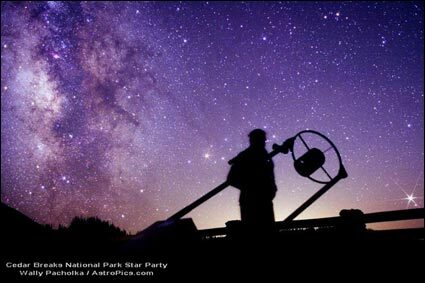 Don’t forget to look for night sky activities on the web site of the individual national parks you plan to visit this year. For example, Acadia National Park in Maine held its first Night Sky Festival last September, urged on by the Bar Harbor Chamber of Commerce and several other community organizations. The next festival is planned for September 9-12, 2010, with a variety of day and nighttime programs taking place in the park and surrounding community. Further information is available by contacting the park at 207-288-8703 or at www.nightskyfestival.org/Festival. Bryce Canyon National Park in Utah has been hosting stargazing programs since 1969, and will hold its 10th annual Astronomy Festival July 7-10, 2010. This four-day event also features daytime and nighttime activities for all ages, and celebrates one of the last remaining sanctuaries of dark skies. Visitors are encourage to plan ahead for this event, more information is found at: www.nps.gov/brca/planyourvisit/astrofest.htm. To help meet the demand for night sky interpretive programs, the National Park Service Night Sky Program last year recruited 19 volunteer astronomers from around the country who were then placed in national parks, started a loaner telescope collection, produced audio podcasts and brochures, and supported the stellar night sky poster art by Dr. Tyler Nordgren, an astronomer at the University of Redlands, California. Nordgren spent a one-year sabbatical in national parks where he collected his experiences into a book and drafted the series of 14 posters that harken to the Works Progress Administration posters of the 1930’s. The full series of night sky posters is available for browsing at: bulldog2.redlands.edu/fac/tyler_nordgren/Gallery/NationalParks/Parks.html. “Even though our sources of inspiration may change, the value of national parks grows over time,” Director Jarvis said. “And as the backyard starry sky is lost to urban America, people increasingly seek it in their national parks. “The night sky is every bit a part of the park as land, water, wildlife and those famous sunrise and sunset scenes. It’s our responsibility and our pleasure to preserve the night sky for this and future generations.” Visit us on-line: www.nature.nps.gov/air/lightscapes. Additional Park Event Info Pending.